I've been watching Psych from the first episode; I can tell you exactly where I was when I saw the first commercial and knew that this was going to be the greatest television program that I would ever watch. To be honest, I thought this last season of Psych was really going down hill, so I stopped watching entirely, about 5 minutes into "Remake A.K.A. Cloudy...". The problem I had with it was Psych's new lack of semi-seriousness and standard plot week-to-week. Perhaps not something I should expect, but growing accustomed to it may have been a factor leading to the show's initially perceived demise. The usual Psych formula, stumble on a crime scene, make an accusation of murder, eat some food, be wrong a couple of times (still retaining the majority of a correct direction on the murder), get into a tricky situation needing Juliet's help, eat some more food, drive around in the blueberry, arrest the baddie, and save enough time for one last final comedic moment, was under attack; by who? I couldn't tell you (network executives, need to innovate, need for more creative freedom; all good guesses). That all started to happen around season 6. 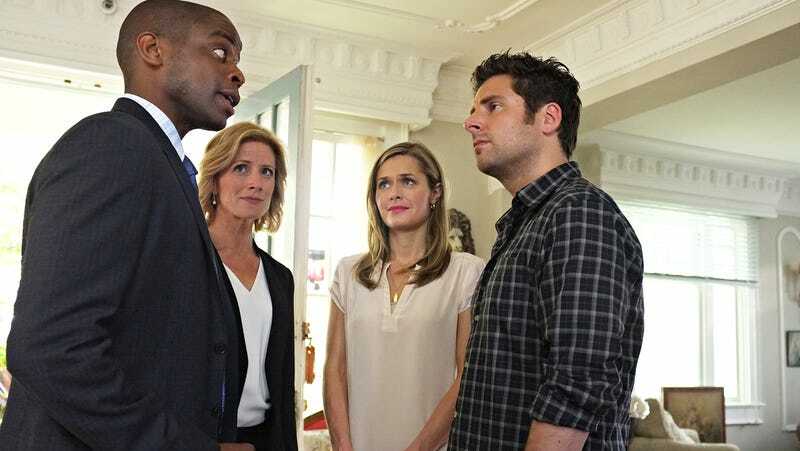 Psych still had its moments, but for some reason, I was not appreciating the comedic program that Psych had turned into. I was stuck in the past image of the quirky-yet-simplistic crime comedy with a shallow layer of 80's references that ultimately and reliably solved a murder based on Shawn's "psychic" abilities. The remake episode "Remake A.K.A Cloudy..." completely threw me off guard; I was left almost offended at what my best friend had turned into. Did he run out of ideas? What's going on? Why in the world would this be funny? Those 5 minutes hung in the air for 3 months, ignored and shunned by other shows that retained a more constant plot, or at least never initiated one in the first place. Though, knowing that I needed to watch the finale to complete the empty feeling inside, I began to suffer thought the remake once again, only this time I started to see the final season for what it was. I ended up finishing the last season in 2 days with no regrets. Chart via GraphTV, following the link is an interactive version. Here are some episodes and points I would like to talk about in greater detail. I started this episode over, and then noticed that the cast was recast in inappropriate roles (or were they appropriate...), then realizing the joke. I was waiting for the "My Cousin Vinny" reference the moment I saw Ralph Macchio cast as the prosecution. Sidebar: I wonder why they didn't do an episode with both Ralph Macchio and Billy Zabka, since they were both in the final season. Psych had turned into something else, and while I didn't notice it while following along with the series, I could now after clearing my head. Why was this episode rated so badly (see chart above, its the low blue ball)? The title cut my heart open when I saw it prematurely, and my heart was still broken when I found out what it was referring to minutes into the episode. I was really surprised that Gus never truly ended up with a female companion after all the effort they made hyping it up during the last season. That is all. For me, this is the one and only television romance that had to work out. After being toyed with by How I Met Your Mother, utterly confused by Dexter, and put in existential disdain by Chuck, I needed this vicarious victory of the soul. It's one thing when a single television program sabotages the classical happy ending, it's another when every program gets the memo. Thank you Psych. I needed a victory. The final episode saw the break-up of the best friend duo of Shawn and Gus, but only until Gus decided that he couldn't stay in his 9-to-5 freeway of a job and ultimately was born to solve crimes in the fast moving environment that comes with his best friend. Psych is ultimately the triumph of two best friends who push each other to grow in different ways that each would never have aimed for alone, realizing now that they couldn't live without the other's support. It's like they left it open for something else, all of them in San Francisco with Monk, yet completed enough to end without anyone complaining about a cliffhanger. If Shawn and Gus didn't have to say goodbye, then I wont either; Psych will remain in my Netflix queue and on my DVD shelf until the day I die. Thank you Steve Franks, James Roday, Dule Hill, Timothy Omundson, Corben Bernsen, Maggie Lawson, and everybody else involved with the glorious television program that I am sure to watch to the end of my days. A Final Word: If you have been holding off on completing Psych for some reason and thought that this would be a way for you to understand the ending without having to suffer thought the final season, please turn around and go watch it, but this time with a different perception of what Psych can be.